Board Index > General Chat > Anything Goes > What's In Your Stereo Right Now? Author: Subject: What's In Your Stereo Right Now? "The Best Of Uriah Heep", 20th Century Masters Millenium Collection. At the exact moment I'm posting it's Wish You Were here, by Floyd. A minute ago it was Alabama's Dixie Land Delight. Just joined the 21st century and began hooking my laptop up to my home stereo a couple of weeks ago. Currently listening to streaming jazz from one of the country's greatest radio stations, WWOZ in New Orleans. "Little Martha" with Warren, Derek and Oteil from 3-14-09 Beacon Theatre, A show I was at and just got the CD from Hittin' the Note...... LOL Talk about a commercial plug!! Now it's a Beatles cover by Ray Charles--Eleanor Rigby. Dave Alvin & The Guilty Women--self-titled. a lil dust and Where they all belong" marshall Tucker..
Levon Helm -- Electric Dirt. Got it for Christmas. Huge fan of the CD. My stereo is hooked to my tv and presently I'm watching Pink: Funhouse Tour Live In Australia. And no, we're not talking Floyd. via airtunes on a airport express hooked up to my Jolida tube amp. to any other computer or TV/stereo with Windoze 7. Great new feature for them. Apple already had this done with Itunes and Airtunes. grateful dead...truckin' up to buffalo, im a fan of the mydland era! I like the way the original poster said what's in your "stereo". Remember how big stereo speakers were back in the day? wott do you mean "back in the day." I still have big speakers. you should look at the size of some of the monsters in today's audiophile catalogs. LOL I love that old fashioned stuff!!! Now you get more power from speakers one tenth the size and at a fraction of the cost!! 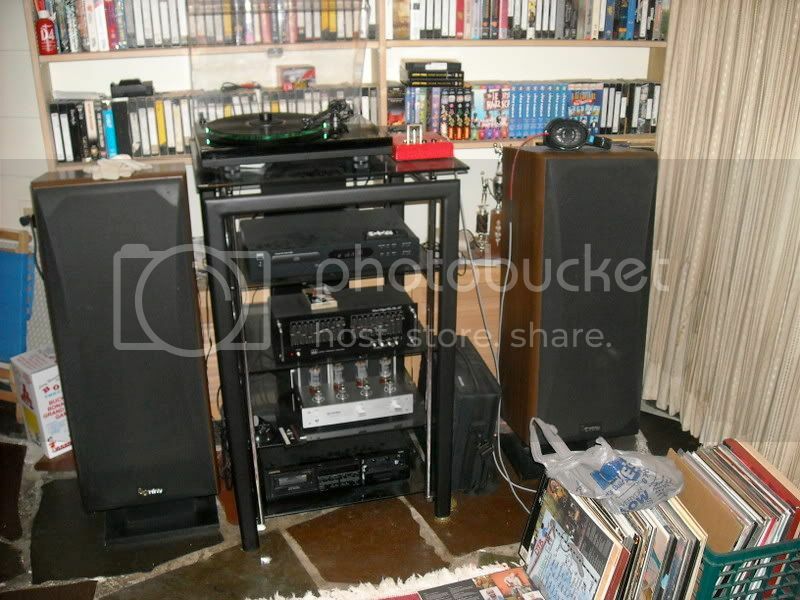 The cassette player and turntable in that pic are awesome too! ya still need big drivers to move a lot of air. even my modern 5.1 setup with little 5 &1/2 inch drivers need a 12 " inch subwoofer to do the bass. NP Guns N Roses Chinese Democracy 180 gram vinyl. played LOUD on BIG SPEAKERS!